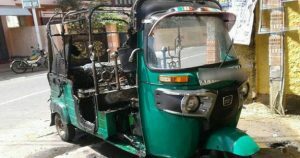 Jaffna News: A three-wheeler parked in front of the Vembadi Women's High School in Jaffna suddenly burned and shocked. The cause of this firebrand has not yet been found. However, the police said that the gas leak could be fired on the machine. The incident took place at 9.45 am yesterday, after which the driver was parked in front of the school and went into school. Driver said he had been burnt in a three-wheeler in about 20 minutes after he stopped. When he saw the fire burning in a three-wheeler, he said that fire was spreading in the entire area of ​​the three-wheeler and completely damaged when he tried to extinguish the water.